I love travelling by train and VIA Rail Canada is great. There are no body cavity checks, blood tests or shoe removal exercises, the service is friendly, your fellow passengers don’t seem as stressed and the train leaves on time! For short hops – say, a one hour flight – by the time you get to the airport an hour or two ahead of time, wait for the delays, stand in line, go through security, stand in line, wait, stand in line, get on the plane, wait, taxi to the runway, wait, taxi on the runway, fly, land, taxi again, wait, get off the plane, walk through the airport and get to your ground transportation – the train can actually get you there faster. While on the train a couple of weeks ago, enjoying a nice cup of coffee and reading a book; my consciousness was shattered by this delightful phrase. “Can you fill this out for VIA?” Not ‘can we have your opinion’ or ‘sorry to bother you sir, would you have time to let us know how better to serve you’. Nope. They wanted me to put down my book, grasp the complimentary golf pencil and fill out a two-sided, double gate fold cardboard document the size of my laptop. I don’t think so. Before I could engage with my interrupter, she had vanished into the next car. I then opened this manuscript and began to scan its contents. 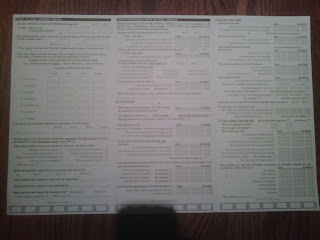 This behemoth came with 56 questions! 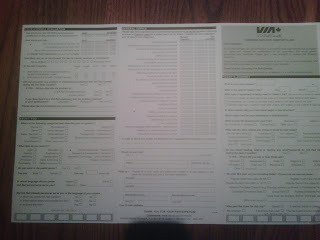 I was on a four hour train ride and this thing would have taken me an hour to fill-out. Which begs the question: Who would? While we grapple with metrics and ROI one thing has never changed – keep it simple. If you are thinking of conducting research, conduct on yourself first. Ask yourself the hard question: Would I actually participate in this? Would I actually sit on my delightful train ride and put aside work or a good book to fill out this 56 question investigative research piece? Really? In order to think like your customers, you need to be your customers. To insure you get accurate feedback you need to engage rather than interrupt. How do you ask your customers and clients for their opinion?